Peggy Jean Ballantine-Carlson was born September 19, 1933 in Cloverton Minnesota and passed away peacefully at Oak Meadows Memory Care in Oakdale Minnesota on January 25th. Devoted wife of the late Lee Ballantine and the late L. Merton Carlson. She is survived by her children Saffira M. Windsinger, Steven (Kim), Tom (Jody), and Wayne (Vanessa) Ballantine, 8 grandchildren and 9 great-grandchildren. Peggy graduated from Sandstone High School Sandstone Minnesota with honors. She was a homemaker, and a postmaster who later became a school bus driver for 40 years. She enjoyed bowling and crocheting. Her love of nature fueled her passion for gardening and camping with her family and friends. 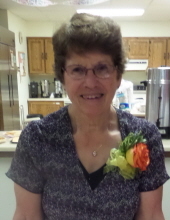 Peggy was active in her church and enjoyed singing in the choir for over 50 years. Memorials to honor her life can be sent to The United Methodist Church in Osceola Wisconsin. To send flowers or a remembrance gift to the family of Peggy J. Ballantine-Carlson, please visit our Tribute Store. "Email Address" would like to share the life celebration of Peggy J. Ballantine-Carlson. Click on the "link" to go to share a favorite memory or leave a condolence message for the family.